Littering can be defined as making a place or area untidy with rubbish, or incorrectly disposing waste. Littering causes pollution, a major threat to the environment, and has increasingly become a cause for concern in many countries. As human beings are largely responsible for littering, it is important to understand why people litter, as well as how to encourage people not to litter. This paper explores the reasons and consequences of littering and suggests possible solutions based on international experience. Laziness and carelessness have bred a culture of habitual littering. Carelessness has made people throw rubbish anywhere without thinking about the consequences of their actions. Many people do not realize or underestimate the negative impacts of littering on the environment. People believe that their individual actions will not harm society as a whole. As a result, it is common to see people throwing wrappers, cigarette butts and other rubbish in public areas. The majority of people believe that there are others who will clean up after them and consequently, the responsibility of cleaning up litter usually falls on local governments and taxpayers. Thus, the lack of responsibility to look after public places is another problem. In Georgia, many residents living in urban areas blame the lack of public trash cans for widespread littering in the streets. Several studies have proven a correlation between the presence of litter in a given area and the intentional littering of that particular spot. When a person sees litter accumulated in one place, it gives the impression that it is somehow acceptable to litter there. This, along with the absence of appropriate local waste services, might be one of the main reasons behind illegal dumping in Georgian villages. Litter adversely affects the environment. Littering along the road, on the streets or by the litter bins, toxic materials or chemicals in litter can be blown or washed into rivers, forests, lakes and oceans, and, eventually can pollute waterways, soil or aquatic environments. Based on recent data, 7 billion tons of debris enter the world’s oceans annually and most of it is long-lasting plastic. Litter also reduces air quality due to the smell and toxic/chemical vapor emanating from the trash. A polluted environment can encourage the spread of diseases. Toxic chemicals and disease-causing microorganisms in the trash may also contaminate water systems and spread water-borne diseases which can negatively affect the health of both animals and humans if unclean or untreated water is consumed. Cigarette butts take a grand total of ten years to decompose because of cellulose acetate, contrary to the common perception that cigarette butts decompose very quickly in only a matter of days. In reality, cigarette butts are a serious threat to the environment, as they contain toxic substances like arsenic which can contaminate soil and water. Plastic litter is another threat to the environment and its inhabitants. It has often been mistaken for food by both land and marine wildlife. When consumed by animals, they reduce the stomach capacity since they cannot be digested. In the long-term it affects the animals’ eating habits, eventually killing the animals. Much of marine wildlife including birds, whales, dolphins and turtles have been found dead with plastic and cigarettes found in their stomachs. An estimated 100,000 sea mammals are killed by plastic litter every year. Some of the materials may also be poisonous or contain sharp objects therefore damaging the animal’s vital organs or severely injuring them. Another negative aspect of littering is that it is too expensive for a country, society and individuals. Cleaning up litter requires a huge amount of money that is financed by taxpayers that could be used in more productive ways. Littered places are visually displeasing and they depreciate the aesthetic and real value of the surrounding environments. Places with large amounts of litter are often characterized with homes and property that are less valuable as a result. Similarly, it affects tourism as it makes city areas and roadsides look disgusting and tourists tend to avoid staying and even visiting areas that are littered. Furthermore, littering can lead to car accidents. Some trash in the road is enough to create a dangerous situation that could result in serious injuries or death. The ideal way to handle the problem of littering is for each member of society to take responsibility and try their best to properly dispose waste. If citizens are required not to litter, appropriate conditions must be provided by local governments. Measures must be taken by appropriate local authorities to ensure more garbage bins are installed in various areas for effective garbage disposal. Installing enough garbage bins in town centers, walking routes, public areas, and near bus stops as well as fast-food restaurants offer convenience in disposing and collecting litter. To avoid additional problems due to overfilling, the bins must be emptied regularly. Unfortunately, the existence of garbage bins do not guarantee that waste will not be dropped in the streets. Enforcing strict litter laws will encourage people not to litter in private and public places. Such laws work towards prohibiting illegal dumping and littering. According to research conducted by the 2011 Keep Britain Tidy campaign, attitudes concerning enforcement are greatly shaped by the degree to which an individual sees it as a threat and many do not think it is likely they will be fined for environmental offences. The same research also reports that people who have seen or heard about fixed penalty notices being issued are less likely to litter. Littering penalties and other enforcement measures are common practices worldwide. For instance, the penalty for the first case of littering consists of fines from $100 to $1000 and at least eight hours of community service litter cleanup in California. For subsequent offenses, fines and the duration of required community service increases. In Louisiana, intentional littering can result in a one-year suspension of your driver’s license or imprisonment for up to 30 days in addition to standard fines and community service. According to the Code of Waste Management, adapted in 2015, penalties for dropping municipal waste in the street varies from 80 to 150 GEL in Georgia. The Department of Environmental Supervision, Ministry of Internal Affairs and the local self-governments are the responsible institutions responsible for executing the law and violators are fined systematically by the appropriate institution. However, authorities cannot fine someone unless they actually see them litter and it is impossible to control every street. Undoubtedly, penalties have a real effect on littering behavior, but education and raising awareness is crucial in guaranteeing long-term results. Community clean up events can be an effective way for spreading anti-litter messages in society. The issue can also be incorporated in bulletin boards, TV programs, social media platforms, and newsletters in a more intensive way in order to spread the message widely. 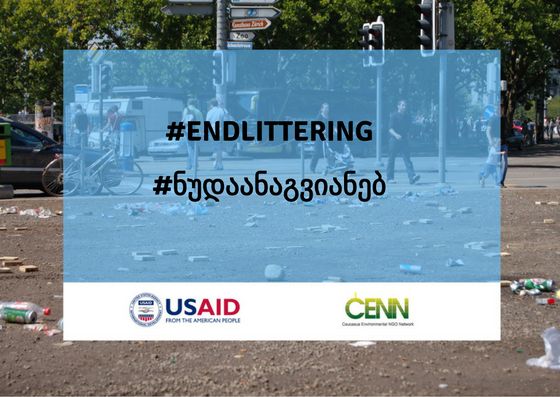 Furthermore, an anti-littering sign might be placed in highly littered areas such as the streets near public transport stations. These signs serve to constantly remind people that littering is a bad thing that should be avoided. Some people argue that not only penalties but rewards also might be a good idea. People “caught” doing the right thing may be given rewards like shopping vouchers and their positive disposal behavior publicized in the media or social networks to encourage others to dispose of litter properly. What is Littering? Conserve Energy Future. Rachel Oliver. Walking Green: Ten Harmful Effects of Litter, Green Eco Services, Cathy, 2008. Twenty Astonishing Facts About Littering, Conserve Energy Future, Rinkesh, 2018. What is Littering? Conserve Energy Future, Rinkesh. The Effectiveness of Enforcement on Behavior Change, Keep Britain Tidy, 2011. States with Littering Penalties, National Conference of State Legislatures, 2014. Why do People Litter? Litterology, Karen Spehr and Rob Curnow, 2015.